Wears the standard shinigami uniform. Henji has two personalities. first is the outside. Kind, Gentle, and loving to most. In this personality he hates with a passion his Zanpaktou as he believes it represents the inner him which he tries to control and resist. He loves to play around and be as comical as possible. When he needs to be he is as serious as death but when he doesn't need to be he even pretends to get drunk of of smelling sake. Sipping tea and secretly groping women are his favorite topics. He hates to fight and would rather drink tea or not fight at all if he had to. Inside, his personality is demonic and devilish. As blood is spilled in combat the realities of his mind shift. He becomes a blood thirsty and arrogant person. He minds only those who are close to him. his eyes become red when he wants to kill. From there his eyes turn black when he becomes fully intent on killing his target. At this point he has only a simple thought of right and wrong. He thinks that only those are close to him are friends and the rest are foes. He has a phobia that Human vehicles are always watching him. There's not much to tell for this man's life. It started in the noble house of Hiorako. He grew up in Soul all his life and followed his parent's foot steps to the end of their lives. He was at a young age when they died as well. After he perused who he thought was the killer and tried to destroy them. however that did not work out and almost caused a war between the houses. This was resolved and he entered the academy. 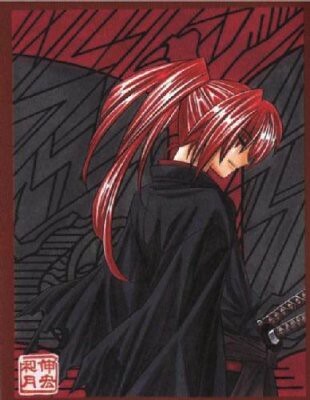 From there he attended advanced Kido, Hoho, Hakuda, and Zanjutsu. However he excelled in all he was still only just barely better than his level. From there he would randomly visit Rukongai and see the poor living conditions of his fellow souls. During this time he met a small girl he took in as his own daughter. After she was brutally killed and raped in his own home, which was the time that his mind fractured and thus the inner him was born. He went through the academy and after this he became the lazy person he is today. Partly from his daughter and partly from the fact he started not to exactly show he cared for anyone but himself. He met Taicho Fate and became emotionally attached by their meeting and wanted to peruse a close friendship with her. He found solace in the fact that he was lazy but then again he also found solace in the fact that he was the top of his class even if by a little. But this didn't mean he was better than anyone else, simply that he could hold his own. After the academy he wandered a bit from Division to Division. Stopping at places like 2nd to learn how to control his reaitsu well. The manifestation of this zan is a buff looking male. His chest and right shoulder bear a mouth. His right hand has four large fingers that resemble a monster or alian from a scifi story. He wears a Blue armor that seems to radiate a purple arura not seen in the pic. Bearing a lava red right eye, black abyss in his left socket, he also bears a rather large sword. This sword has one large double edged eye that sees both ways and essentially is what gives off the vibrations. On his forehead he has a large bone horn and the edge of the blade of the sword is rugged and torn apart with cracks and dents in it. The blade is large and thick as well. Anything to do with death. Like's to taunt Henji, his friends, and his opponents. This Zan is blood thirsty and always wanting to draw blood. In fact there is a pact made with him and his master as if he is drawn the blade must be tainted by blood no matter what. Other than being blood thirsty he also feels the sense of Honor and duty, however, he finds the act of drawing blood more to his liking. He always has something smart to say about his master, his friends, or his opponents. It seems the only time he likes being with his master is during fights, which is odd in it's self. The inner world is a vast blood fest. Bodies litter the ground, the smell of rotting flesh is smelled and the bodies are torn apart. The ground is red, blood stained, grass and nothing is not stained red other than the spirit. It's endless, the horizon, as it is always sun set, the best and most heart felt dusk scene one could have. They are similar after Henji turns to his inner self. The sealed form is simple yet elegant in a way. It's a standard black blade, tsuka, tsuba, and Tassel. the tassel is made of black horse mane. The blade it's self is black but has the slandered silver cutting part of the blade. This Zanpaktou has a safety measure built into it. If someone other than Amagai gets a hold of it and tries to use it then several spikes jut from the tsuka and hilt. Also, because the Zanpaktou is essentually a living thing it knows whether it is being used by him or not. If it is not and the spikes jut out and things or it is lost, on a command of word or the snap of his fingers it will return to him. "Anata no akumu misete kudasai, Akuma." The blade changes to the manafestation's blade. It has a large purple eye that see's both sides of the sword as it is a double sided eye. The blade it's self is somewhat less taken care of. His right arm becomes like the manafestation's right arm. His shoulder becomes a mouth, his right hand morphs to a four fingered hand of a monster. His chest also recieves a mouth as well. The waves vibrate at 250 per second, these waves are not harmful to any material object and orriginate from the eye in the center. They ignore invulnerability and destructible defense. The Ability of this zan is intricate and interesting. Once the waves hit their target, the ability of the Shikai is engaged to bring out the fears of the opponent more easier and the availability to the wielder of the blade to draw out the fears of the marked foes. This is an affliction. Those marked by Akuma may now be targeted by Akuma's techniques. This technique cannot be used on a target not marked by Pesadilla. Amagai will send a chilling wave at his 'marked' opponents. If the target(s) get hit, they will be paralyzed for one posts physically. During this time, the affected target(s) will be mentally trapped for over 72 hours while receving many levels of traumas, their own phobias, and severe fatigue, dependent on the person. This is considered an affliction. Everytime this technique is used, the worst it gets for the marked target(s). During the 1 post stun, it is only for 3 seconds and increases per 3 seconds for each use of this skill.If the tech connects then inside the mind of the opponent a realm is created in which Amagai can then striek, stab, or attack his opponent. However, through this the oponent is never phyisically touched. This is all done in the the next attack post of Amagai after the opponent is stunned. This tech is also affective by a range of 25 feet or if the opponent looks into the eye on the sword. The blade changes to the manifestation's blade. It has a large purple eye that see's both sides of the sword as it is a double sided eye. The blade it's self is somewhat less taken care of. His right arm becomes like the manifestation's right arm. His shoulder becomes a mouth, his right hand morphs to a four fingered hand of a monster. His chest also receives a mouth as well. The waves vibrate at 250 per second, these waves are not harmful to any material object and originate from the eye in the center. They ignore invulnerability and destructible defense. The ability of the bankai is simply adding to the shikai ability and brings out the Zanpaktou manifestation. This manifestation can shift it's appearance and become what is willed of it. The manifestation of the zan can shape shift to take the form of the worst nightmare so that the nightmares become more interactive. The Manifestation is able to attack and is essentially brought to life for this ability. Allowing him to stay a bit away and plan his attacks according to his opponent's movements.